In what was a highly interesting match from an analytical standpoint, Hertha BSC held Borussia Dortmund to a 0-0 draw. The Berlin side put a serious challenge in front of Thomas Tuchel’s team. Rather surprisingly, Tuchel decided to leave Shinji Kagawa out of the squad due to bad training performance. Instead, Moritz Leitner again sat on the bench, as the 23-year-old apparently has earned Tuchel’s trust. Returning to the starting XI, Gonzalo Castro played as the second centre-midfielder alongside İlkay Gündoğan in Dortmund’s well-known 4-3-3 formation. Hertha head coach Pál Dárdai had to replace playmaker Per Skjelbred, who was suspended due to a fifth yellow card he had seen in the Bundesliga match prior to the encounter with Dortmund. The Hungarian chose Jens Hegeler over the better technician in Alexander Baumjohann, as he stuck to their 4-2-3-1 shape, with Vladimír Darida as the number ten in front of Hegeler and Fabian Lustenberger. After witnessing the first few minutes, it became clear what Dárdai’s plan looked like. He used both Hegeler and Lustenberger as physically superior man-markers in the middle of the park, while Darida covered Julian Weigl, Dortmund’s deep-lying playmaker. Overall, Hertha followed a rigid man-marking scheme during the first phase of the game. As a consequence, Hegeler moved to the left side, as he was supposed to cover Łukasz Piszczek, while Lustenberger was asked to put a blanked over Gündoğan. All of a sudden, Castro was Dortmund’s open man. Yet, goal-keeper Roman Bürki or Sokratis didn’t have the confidence to play long balls across the middle, fearing that Berlin could intercept the pass and hit the Black and Yellows on the break. Even though Dortmund identified Dárdai’s defensive strategy fairly quickly, Hertha still were able to put pressure on Dortmund’s playmakers, more or less taking the guests’ most significant weapons out for quite some time. In the later stages of the first half, Hertha utilized a more zone-orientated defensive scheme, as they had already done at the beginning, when Dortmund bypassed Berlin’s first pressing line. Although it could have been done in response to Gündoğan’s adjusted movement, Hertha had in mind to save energy for the second half. Offensively, the hosts mostly relied on Kalou’s variety of movements on the pitch. The veteran didn’t cover Schmelzer as closely as the other Hertha players their respective opponents. Kalou therefore wanted to take advantage of the free space in Schmelzer’s back following turnovers. Plus, the 30-year-old often ran into the central zone up-front, pressuring Dortmund’s centre-backs in collaboration with Vedad Ibišević. 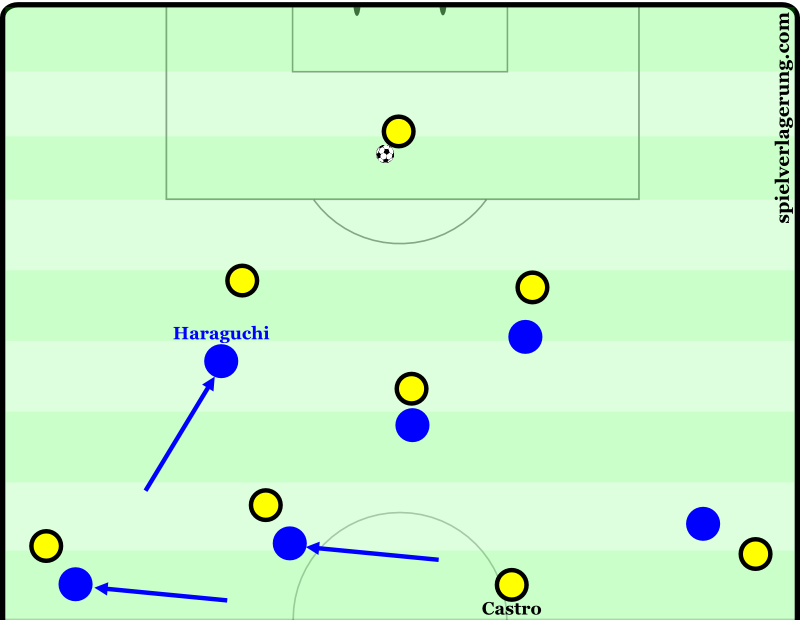 A few times, Hegeler also made runs towards the off-side line, while Darida usually stayed in a deeper position to link up with Lustenberger and both full-backs. Speaking of Hertha’s full-backs, both Mitchel Weiser and Marvin Plattenhardt varied their positions in the initial build-up play. Dortmund only pressured Berlin’s playmakers cautiously, while the use of cover shadows to shut passes to Hertha’s full-backs down was ineffective. After the early stage of the match, Tuchel changed the defensive formation into a 4-4-1-1, with Castro as number ten, while Mkhitaryan and Reus marked the opposing full-backs more closely. In the first few minutes, Marco Reus played on the left side, where he sometimes drew Weiser, his man-marker, to the middle, giving Schmelzer space to advance. Later on, Reus and Mkhitaryan constantly switched positions. As mentioned, Hertha were able to shut down Dortmund’s passing options in the middle third, while Bürki, as open man, did not provide the necessary long ball accuracy. After a quarter of an hour, Gündoğan dropped back right beside both centre-backs for the first time, escaping from Hertha’s man-marking defence. With Julian Weigl also dropping between Sokratis and Hummels, the four Dortmund players could easily circulate the ball in front of the opposing block, as Hertha intended to watch the passing lanes through the middle. At this point, a well-known problem Dortmund have faced for quite a while re-emerged. The Black and Yellows had four players at the back and four or five players up-front, with little to no presence in midfield. Hertha reacted intelligently, when changing their defensive formation into a 4-3-3, diagonalising both lines of three. It has to be mentioned that Hertha sometimes showed a lack of protection against Dortmund’s dribbles, but benefited from Dortmund’s tendency toward playing passes too fast and making hasty decisions after winning one-on-ones. Moreover, Hertha at times lacked compactness near the ball, but usually were shaped narrowly behind the pressing line to occasionally send a few players forward to counter-press. They capitalized on every little technical mistake made by Dortmund. During the break, Tuchel told Gündoğan to move to the left half-space, because Dortmund should make Kalou use his energy defending the wing overloaded by Gündoğan, Reus, and the advancing Schmelzer. Meanwhile, Castro rushed forward, approaching the offside-line to support Pierre-Emerick Aubameyang up-front. After ten minutes into the second half, Kalou and Haraguchi switched positions. “It took us a while to ward off the relentlessness and the aggressiveness of Hertha. They defended compactly and with great gusto,” said Tuchel after the match. 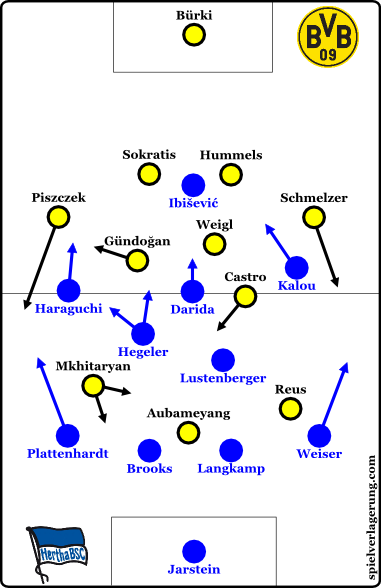 While Hertha defended more and more passively, Gündoğan stepped up his game, orchestrating various attacking plays. In addition to that, Reus and more importantly Mkhitaryan showed lateral movement in between Hertha’s lines, which made it easier to receive balls properly and picking up speed afterwards – rather than having an opposing defenders right behind them. Unfortunately for Dortmund, they cooled down after twenty minutes, but still seemed to have the momentum on their side. Tuchel replaced Aubameyang and Castro with Adrián Ramos and Christian Pulisic, while Dárdai brought Johannes van den Bergh on for Ibišević, with Kalou playing as centre-forward from then on. The hosts clearly intended to hit Dortmund on the break. And it almost worked out. In the 77th minute, heavy touches from Gündoğan and Pulisic left Dortmund exposed on the break. However, Schmelzer held up a three-on-one situation, forcing Kalou to strike wide. Just before the end, Alexander Baumjohann had also a chance to steal the win for his team, when he rushed towards Bürki. Yet, Sokratis recovered the situation. So, keeping Dortmund quiet can be done. The clash between the third ranked team and the second ranked team in Bundesliga apparently was destined to end up in a draw. Like some teams before, Hertha were able to negate the threat of Dortmund’s playmakers and attacking line for the better part of the first half. As they couldn’t maintain the necessary intensity when defending, Dortmund looked in control after the half-time break, but couldn’t take advantage of the situation in terms of end product. Hi. Came to know about this site recently and loving the analysis and articles. I just got my beginners coaching badge (India) and this site is really helpful when it comes to understanding the complexities of football. I just want to make one suggestion: is it possible that we the readers be informed beforehand of the games you guys plan to analyse so that discussions on games could be even more interesting. Other than that great job and hope to learn even more. I coundn’t see the game so many thanks for the analysis!